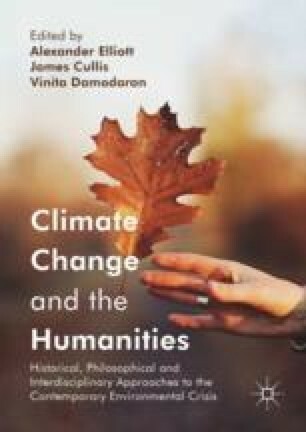 This chapter examines connections between the humanities (understood as a grouping of academic disciplines that includes history, philosophy, literature, language, art and music) and climate change. The relationship between the two has a long and complex past; a past which has informed, directed and helped co-create the current debate and its understanding as a ‘crisis’. It will be shown that climate change needs the kind of understanding that only the humanities can provide, and that the humanities have a crucially important role to play in the on-going debate. EJOLT- Environmental Justice Organisations, Liabilities and Trade, (2011), www.ejolt.org. Futureearth- research for global sustainability, (2012), www.futureearth.org. IHOPE- Integrated History and Future of People on Earth, (2003), www.ihopenet.org. IPCC- Intergovernmental Panel on Climate Change, (1988), www.ipcc.ch. United States Committee for the Global Atmospheric Research Program, (1975), Understanding Climate Change- A Program for Action, National Academy of Sciences: Washington. Available at: https://archive.org/stream/understandingcli00unit/#page/n7/mode/2up.